Over the years, I’ve served as secretary for several different groups. I’ve mostly used Microsoft Word and Microsoft OneNote for taking notes during meetings to prepare meeting minutes from, but I’ve always looked for a tool that really took care of my specific minute-taking needs. Minutes.io pretty much hits a home run in that department. It’s designed specifically for taking the minutes of a meeting and it does that job spectacularly. I will be using this at any meeting in the future where I take minutes. Work occurs when you’re doing something you don’t want to be doing. If you’re doing something you want to be doing, how is it work? I always strive to be doing something I want to be doing while also getting paid to do it. I found this talk to be utterly fascinating. I am constantly trying to transcend my own abilities and lose myself in the flow of what I’m working on. There are indeed some religious and spiritual ties to that practice. I love the architecture of churches. I love how the steeples and spires rise high and enter the horizon in a town or a city. I love the flowing lines of the buildings. There’s something really beautiful about the architecture of a church. Thanks to Krzysztof Dobrzański for the picture. The people that achieve success are those that are patient and apply continuous effort over a long period of time, because eventually they’re going to find that success. If you give up quickly, it’s going to be impossible to succeed in what you want to do. Spring seems to have arrived in a rush this week, with temperatures jumping from the 30s and 40s to the 70s and 80s without a transition in the middle. 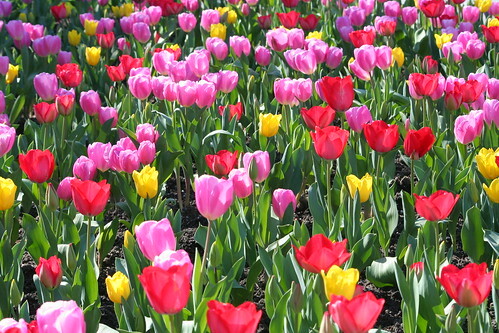 Whenever I think of spring, the first thing I think of is tulips. Perhaps the reason for that is my favorite spring community festival, Tulip Time in Pella, IA, which happens on the first weekend in May each year. Thanks to John Morgan for the picture. The music is amazing, as is the focus and concentration of the performer. Watch it once with your eyes open, then listen to it once with your eyes closed. You take away completely different things. I keep this quote in mind whenever I think of any political issue. So often, we trade liberty for safety as a society. Usually, it ends up being a mistake. I really enjoyed this short film about a person who puts all of their money on red on a roulette table. Chance exists. A good, lucky player is one who is most able to capitalize on that chance. Make moves in life that give you the best opportunity to capitalize on chance.